Guwahati Commissioner of Police, Pradip Saloi, on Friday assured the protesters of arranging a discussion between the agitating organisations and the government relating to Citizenship (Amendment) Bill, 2016. 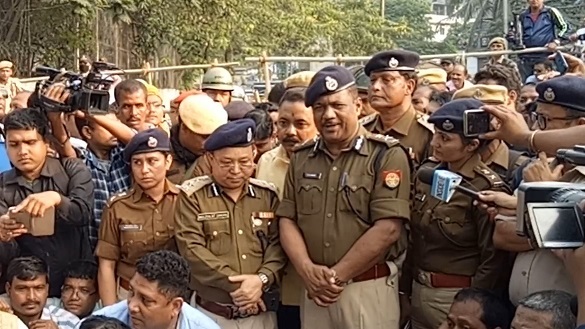 Guwahati Commissioner of Police, Pradip Saloi, on Friday assured the protesters of arranging a discussion between the agitating organisations and the government relating to Citizenship (Amendment) Bill, 2016. He also assured them to convey the decision to the leaders within a week. Later the protesters agreed to leave the spot. Gogoi announced to hold a ‘Gana Satyagraha’ programme at all the district headquarters across the state from November 17 to 27. He also informed that around 50 activists from all supporting organisations would stage an indefinite hunger strike in New Delhi on November last. Slamming the BJP-led government over the Citizenship (Amendment) Bill, 2016, Gogoi demanded either scrapping of the bill or chief minister’s resignation or BJP’s withdrawal from government. It may be mentioned that the activists of KMSS and other supporting organisations had started ‘Sankalpa Sikha Yatra’ on November 11 from Jonai, Diphu, Sadiya and Dhubri to take part in the ‘Dispur Gherao’ programme on Friday. Assam chief minister had issued strict orders to the deputy commissioners and superintendent of polices of all districts to prevent any protest rally from entering Guwahati.